Congratulations are in order for Alliance star Serani who has officially dethroned Bob Marley as king of the Reggae downloads in the United States. For some time Serani’s ‘No Games’ flirted with the number one position and finally June 9th saw him bumping ‘Three Little Birds’ to the number two position which was no small feat. To be the best comes with some pressure as on average it requires an approximate 5,500 minimum sales in downloads and ringtones per week. Big shoes for Serani to fill, but here’s hoping this is just one in many more ground breaking success stories for the talented Singjay. 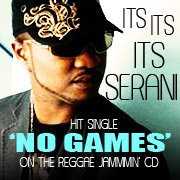 “No Games is actually still gaining in spins across the country," said Serani's manager Julian Jones-Griffith. "This record just won't go away. Its still getting added to playlists in many states across the country every week so it continues to spread." Look out for the “No Games” Remix Serani did with Universal/Island Records label mate Shontelle, recently done while Serani was on tour in the United Kingdom. A tentative release date is rumoured for July 6th. Serani still has some work to do in his quest to be king. Presently Bob Marley still reigns supreme, comfortably holding the number one seat in 8 other countries such as Australia, Luxemburg, Italy and Greece according to the iTunes store.